GE Energy Financial Services, a unit of GE and Landon Corporate Group announced today they will invest about US $350 million (EUR 225 million) in Fotowatio, one of Spain’s largest and most successful solar power project developers, founded in 2004. Fotowatio’s portfolio includes more than 50 megawatts in operation, distributed in 3 solar farms in the Spanish region of Extremadura, and one in Castilla-La Mancha. and more than 900 megawatts of projects in development in Spain, Italy and the United States. Fotowatio uses solar photovoltaic technology, as well as concentrated solar power technology. It has offices in Madrid, Italy and Washington DC. GE Energy Financial Services will invest US $235 million (EUR 150 million) in equity and convertible debt to acquire 32 percent and Landon, a family-owned Spanish holding company with diversified investments, will invest US $118 million (EUR 75 million) in equity to acquire 17.5 percent of a new holding company, Fotowatio SL. The existing Spanish investors will own the remaining 50.5 percent: Qualitas Venture Capital will own 33.5 percent, and Fotowatio’s management will own 17 percent. “With the capital injections from our investors and potential access to GE’s solar modules and steam turbines, Fotowatio can expand its portfolio in growing markets and bring clean, solar-generated power to thousands of homes and businesses across the globe,” said Rafael Benjumea, CEO of Fotowatio. 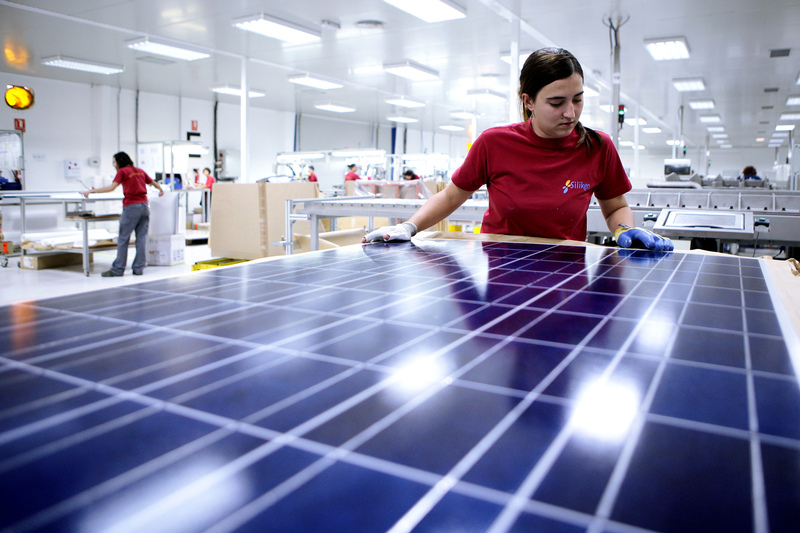 Taking the opposite route of many American companies investing in Spain, such as SolFocus or SunPower, some Spanish firms are being attracted by the opportunities in the US market. Spanish firm Siliken is setting up a solar-panel manufacturing plant in Otay Mesa (San Diego) and a solar-installation business in Carlsbad. By year’s end, the plant will be capable of making enough solar panels to produce up to 15 megawatts. The company presented its manufacturing and direct sales activities in the North American market and its new panels last week at the Intersolar show in San Francisco. This step into the California market is part of the company’s international and vertical integration strategy. The aim is to consolidate its presence in California, marketing turnkey projects for end clients, in order to take on new renewable energy projects in other states. Siliken came to San Diego because of the region’s talent pool and geography, said Francisco Mollá, the firm’s U.S. division coordinator. Also present at Intersolar was Albiasa Solar, a company with technology and experience in both the photovoltaic and thermosolar segments. Albiasa is also opening offices in the US, specifically in San Francisco. In Spain, they are deploying their patented parabolic troughs, tested at the Almeria Solar Platform, at a 50 MW plant in the province of Caceres. These systems offer different advantages aimed at reducing costs, like using less pieces and material than standard collectors and a design that shortens production time and simplifies assembly. A third Spanish company present in California (Redwood City) is Zytech Solar. Zytech is a company with a wide range of products, from regular pv to concentrating pv, low and high, and solar thermal systems (parabolic troughs). It is also one of the winners of the 2007 Going Green competition organized by Always On. Finally, another deal is in the making that could bring yet one more company, this time to Florida. Seminole Electric Cooperative Inc. and Renovalia USA Inc. are in negotiations that could lead to a solar thermal power plant in Florida. The deal was announced by Gov. Charlie Crist, who wrapped up his 10-day trade and business development mission in Europe with a visit to Renovalia’s solar energy facility in Ciudad Real, Spain. Renovalia is involved in the development and engineering of renewable energy projects (a total of 247 MW in installed power). It also invests in technologies to achieve better efficiency – in solar trackers and concentration pv systems. Via Great Falls Tribune: NaturEner, a renewable-energy company that entered the North American market in 2007, officially broke ground last Thursday on the first phase of the 210-megawatt Glacier wind farm, in Montana. The official debut of the project for the public brought NaturEner officials to North Central Montana from the company’s headquarters in Madrid and the U.S. headquarters in San Francisco. Gov. Brian Schweitzer, who has supported tax breaks to lure projects such as the Glacier Wind Farm to the state, also attended. He also thanked developers for choosing Montana and the Montana Legislature for passing the tax incentives for renewable-energy projects. “Wind energy means that’s American energy, produced in Montana with Montana workers” The governor said. This wind project will increase Montana’ s commercial wind power production by more than 200%. The first phase of the project calls for 71 turbines producing 106.5 megawatts of electricity. Completion of that phase is scheduled for October. Another 103.5 megawatts from 69 turbines are planned in phase two. The electricity produced in the $500 million wind farm is headed for California. San Diego Gas and Electric (SDGE) has a power purchase agreement with NaturEner for the entire 210 megawatts of power from the Glacier Wind Farm. Jose Maria Sanchez Sear, NaturEner’s CEO of U.S. operations, said the company is planning an additional 300 to 500 megawatts in Montana projects, including a possible expansion of the Glacier Wind Farm. These expansions depend on whether the Montana Alberta Tie Line is approved. MATL is a transmission line proposed between Great Falls and Lethbridge, Alberta. Toole County Commissioner Allan Underdal said tax revenue in that county from the Glacier Wind Farm will be $2.1 million its first year of operation. “I think it’s a positive thing we use an energy source that just irritated us in the past,” Underdal said. Landowners will also earn a percentage of the revenue produced by turbines on their land. Bill Alexander, the developer from NaturEner supervising the project, said the turbines were built at the plant in Iowa (West Branch) owned by Spain-based Acciona. The blades were constructed by LM Glasfiber and the towers were built by DMI Industries, both of which are located in North Dakota. AEROBLADE is a newly founded Spanish aeronautical company for the design, development and production of wind turbine blades. It is part of the SYNERGY Group, that also includes the aerospace company AERNNOVA. Aernnova provides design and engineering of large aircraft sections for clients such as Embraer, Bombardier and Boeing. It opened an engineering center in Ann Arbor (Michigan) last year. Aeroblade has its main offices, an engineering center and a plant for the production of molds for the wind generator blades at the Bizkaia Technology Park (Basque Country), as well as a plant for the manufacture of the blades themselves in Vitoria, a neighboring province in the same region. The company was created at at an excellent time in the market of wind turbine blade manufacturing, with an anticipated fast growing demand over the next fifteen years. AEROBLADE will be able to take advantage of the synergies within the aerospace group to which it belongs, applying innovative aeronautic engineering in the design, structural calculation and certification of the product. Its aim is to introduce innovations both in the manufacturing process and the product itself, through new aerodynamic concepts and composite materials. The company employs more than 400 staff and has recently announced a 43 million Euro ($68 million) investment in a new production facility in the province of Cadiz, in the south of Spain (more than 2 million sq. feet) for the development of a new range of blades for 1.5-3MW turbines. Pollution Control Industries (PCI), based in East Chicago (Indiana) is now part of Tradebe, following the completion of the process of acquisition last month. PCI manages hazardous and non hazardous waste through three fully-permitted Part B “RCRA” treatment, storage and disposal facilities in Indiana, Tennessee and South Carolina. It serves many industries, among them the Chemical (including pharmaceutical, petrochemical, Paint and coatings and Plastics) and Printing markets. PCI has 370 employees and an annual turnover of $65 million dollars. TRADEBE GROUP is one of the largest privately-held waste management companies in Spain. The Group currently has global sales of over $230 million and 700 employees. Tradebe operates 20 hazardous and non-hazardous waste treatment facilities in Spain, UK, France and the USA. With the acquisition of PCI, Tradebe reinforces its investments and development in the US market, where it already controls two other companies. One of them, Petrochemical Services Inc. (PSI), provides waste processing, tank cleaning and gas-freeing services to the refining, chemical, pulp and paper industries. It currently has operations in New Orleans, Houston, Honolulu, Richmond, Va., and El Segundo, California. The second one, Recovery Recycling Solutions (RRS) is located in Houston, Texas. It offers cleaning services for crude oil tanks and treatment of refinery sludge for clients such as Phillips (Bayway refinery, New Jersey) and other refineries in Louisiana and Texas. The group of companies will operate under the umbrella of the holding co. Tradebe Environmental Services. You are currently browsing the Technology For Life weblog archives for July 2008.